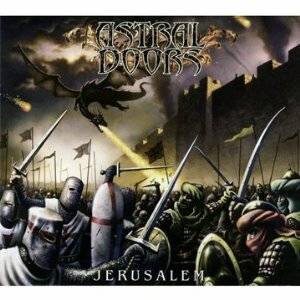 "Jerusalem" is the latest release from Swedish metallers, Astral Doors. Formed in 2002 the band have released six albums plus an EP and a "best of" compilation, and have toured extensively in Sweden and Europe (although its five years since they last visited the UK). Lyrically the album is a strange mix, with most songs being about wars, ranging from the crusades to World War 2, and the Iraq war, but there are also a couple of songs that simply don't fit in lyrically - "child of rock'n'roll" being the most obvious. It feels as though the original plan was to write an album of songs about the crusades but they couldnt find inspiration to get enough songs, so chose a few others to fill up the album. There are strong powerful vocals from singer Nils Patrick Johansson who is often compared to the late great Ronnie James Dio, although I don't think there's all that much similarity, although the band do sound to be inspired by the music of Dio, Rainbow and others. The album is very strong musically - good solid power metal with plenty of great guitar work and well written songs. Combined with the vocals then this is a great combination and the result is a great metal album. I'd recommend the album to fans of Dio or Rainbow as well as Power metal fans. Jerusalem is out now on Metalville records.